Adobe announced the Adobe Photoshop Express public beta for free. Photoshop Express is a web application that takes Adobe’s image editing technology and allows users to edit, store and share up to 2GB of images online, as well as downloading and uploading photos from popular social networking sites like Facebook. Photoshop Express public beta is open for free registration now at the website. Flash Player 9 is required and fast Internet connection is recommended. The registration form claims to be for United States only, you can ignore that one. After login, you see the 3 main section of Photo Express: My Photos, My Gallery, and Browse. 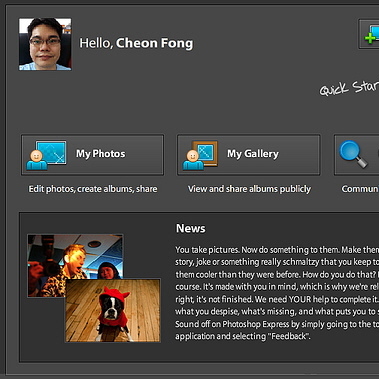 “My Photos” is where you edit photos and create albums. “My Gallery” is the place to view and share your albums. “Browse” to see the galleries and albums by other Photo Express members. To get started, you need to upload photos, therefore the “Upload Photos” is highlighted. You can upload multiple photos at once with the Photo Express uploader. Choose upload to library, new album or an existing album.